﻿It seems that every year, insurance companies come up with a new hurdle for patients trying to get the health care they’ve paid for. Each time, patients must learn the tricks necessary to play this harmful game – or suffer the consequences. But state and federal lawmakers have the power to protect patients from these harmful tactics. Following are five states where legislators are doing just that. In Georgia, a bill that curbs “step therapy” rules for medications is making its way through the legislature. Step therapy is when your doctor prescribes one drug, but your insurer requires you to try – and fail – on a cheaper option before covering the one your physician originally recommended. A recent story by NPR affiliate WABE spotlighted an Atlanta family advocating for the bill. Brannen Whirledge was diagnosed with colitis when he was just 4 years old. The medications he initially tried failed to help, and he continued to suffer from stomach cramps and vomiting. When his family found a medication that actually worked, it was a short six months later that their insurer denied coverage. The reason? The insurer said Brannen must try and fail on the same ineffective drug he already tried, before his prescribed treatment would be paid for. A Georgia House committee has advanced House Bill 63 to help patients obtain exceptions in these situations. “We are very supportive of the legislation, not only for our son, whose future depends on it, but for all other patients,’’ Brennan’s mom, Melissa, told WABE. In Delaware, policymakers are also considering legislation to address step therapy. Introduced near the end of March, House Bill 105 would create a Step Therapy Exception Process so patients being required by their insurance company to go through step therapy protocols may, under specific circumstances, bypass step therapy to obtain the prescription drug they need. North Carolina is also seeing the positive momentum in protecting patients from insurers’ greed with a new bill calling for more uniform step therapy policies and an exception process to protect patients. Finally, Virginia and West Virginia recently became the first states to ban the harmful insurer practice known as “copay accumulator” programs, which prevent drug manufacturer coupons and charitable copay assistance from counting against your health plan’s deductible or out-of-pocket limit. Carl Schmid, executive director of the AIDS Institute, which was among groups supporting the legislation, told Modern Healthcare that not only are copay accumulator programs harmful, they are usually deceptive as well. The Chronic Disease Coalition applauds these states and others considering passing their own laws to ban copay accumulator programs, as well as those where lawmakers are considering other patient protections, such as reforms to step therapy and prior authorization requirements. 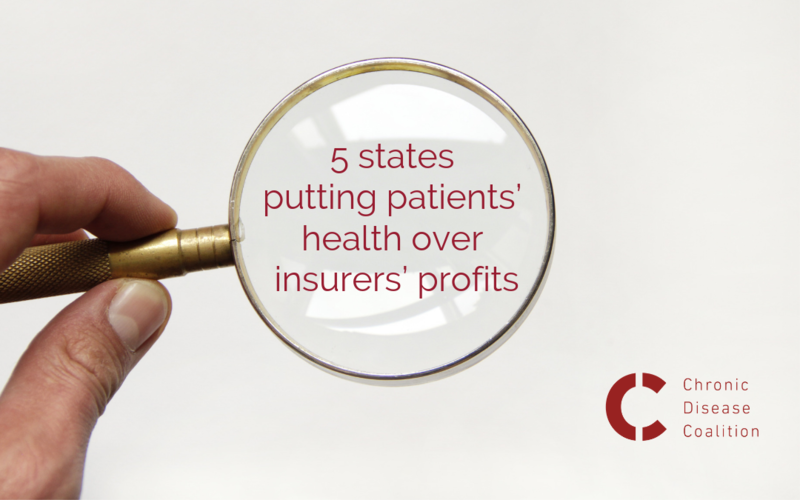 Without strict regulation, the insurance industry will put profits over patients. Luckily, some states are cracking down on insurers and making sure patients have access to the treatment they need. Make sure to visit the Chronic Disease Coalition’s Take Action page to make your voice heard today.